Dynamic Conditional Score (DCS) models provide a unified framework for constructing nonlinear time series models that can deal with dynamic distributions. The emphasis is on models in which the conditional distribution of an observation may be heavy-tailed and the location and/or scale changes over time. In a multivariate context, correlation may change over time and, more generally, the parameters of a copula may change. 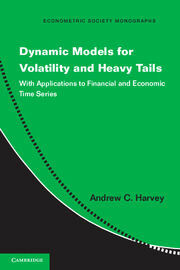 The defining feature of DCS models is that the dynamics are driven by the score of the conditional distribution. When a suitable link function is employed for the changing parameter, analytic expressions may be derived for unconditional moments, autocorrelations and moments of multi-step forecasts. Furthermore a full asymptotic distribution theory for maximum likelihood estimators can be developed, including analytic expressions for asymptotic covariance matrices of the estimators. DCS models were developed over the last few years at the Economics Faculty, Cambridge, and at the VU University Amsterdam, where they are known as Generalized Autoregressive Score (GAS) models; see the link on the left hand side of this page. The above Econometric Society monograph sets out the theory of DCS models and describes the methods and applications developed up to the end of 2012. A considerable amount of work is currently being undertaken to extend the methods further. This website and the website at the VU University Amsterdam list recent working papers and indicate some of the work in progress. A workshop to be held in Tenerife in January will act as a forum for a discussion of current and future projects. Anyone working in the area of nonlinear time series is welcome to submit a proposal for a presentation; see the Workshop link.